Radiator shell in Chrome for the 1928-29 Model A. With radiator filler neck and starting handle hole, as original. Radiator shell in Nickel finish for the 1928-29 Model A. With radiator filler neck and starting handle hole, as original. Steel Radiator shell for the 1928-29 commercial models, painted black. Radiator shell in plain Steel for the 1928-29 Model A.
Hotrod grille shell with no holes for the filler neck, headlight or horn wires, mounting or lacing. Radiator shell in Smooth Chrome for the 1928-29 Model A.
Radiator shell in Stainless steel for the 1930 Model A. The quality of the 1930-31 shells are not the greatest, mounting holes do not always line up and they have a rippled finish rather than a nice smooth finish like the original Ford. Find an original if you can. Radiator shell in Stainless steel for the 1931 Model A.
Radiator Shell Lacing 1928-29. The special double beaded lacing for the radiator shell. Comes with raven finished rivets. Kit contains 5' 6" of 5/8" wide lacing and is 1/8" thick. Made in USA. Radiator Shell Lacing 1930-31. The special double beaded lacing for the radiator shell. Comes with raven finished rivets. 1930-31 kit contains 6' of 3/4" wide lacing 1/8" thick. Made in USA. Radiator brace rods in Stainless for the 1928-31. The two rods that run from the firewall to the radiator. 25-3/4" long. Set of 2. 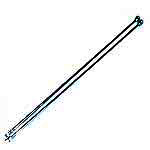 Radiator brace rods Cad Plated 1928-31. The two rods that run from the firewall to the radiator. 25-3/4" long. Set of 2. 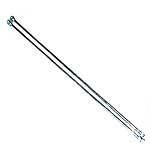 Radiator brace rods in black. The two rods that run from the firewall to the radiator. 25-3/4" long. Set of 2. Brace rod bracket set in Stainless for the 1928-31. This is a pair of brackets for the firewall that the brace rods hook in to. Set of 2. Made in USA. Brace rod bracket set Cad Plated for the 1928-32. This is a pair of brackets for the firewall that the brace rods hook in to. Set of 2. Made in USA. Brace rod bracket mount set 1928-31. Set of 4 locking nuts, and 4 rivet headed bolts used to mount the radiator brace rod brackets to the firewall. Gives it the original appearance without riveting! Made in USA. Radiator shell mount set 1928-31. A set of bolts, nuts, and lock washers that are needed to install the radiator shell on the radiator. Made in USA. Radiator shell Grommet set for the 1928-29 Model A Ford. These are the three grommets that fit into the headlight and horn holes in the radiator shell. Made in USA. Radiator shell Grommet set for the 1930-31 Model A Ford. These are the three grommets that fit into the headlight and horn holes in the radiator shell. The horn hole is smaller in this set for the 1930-31 shell. Made in USA. Radiator emblem USA made for the 1928-31 Model A Ford. It has a blue enamel background like the originals. The difference in this emblem is that it has a threaded stud on the emblem and uses a clip held on with a nut to clamp it to the shell. Made in USA. Self adhesive radiator emblem - Blue On Chrome - Universal Application - 3" Wide x 1-1/2 High. Adhesive tape on the back allows you to adhere it almost anywhere on a flat mounting surface. The 1931's used this stainless emblem that had the lettering stamped in. The lettering is painted black as original. Made in USA. Canadian radiator emblem 1928-30. The Canadian built model A's used this emblem. The only difference in this emblem and the regular model A emblems is the background is black instead of blue. It attaches to the shell just like the A-8212-AC emblem. Radiator badge screws. Small and long! Screws & nuts for mounting radiator badges to the radiator core. Made in USA. Hood retainer 1928-31. The steel clip that the centre hood rod hooks into on the radiator shell. Made in USA. Front Hood Retainer 1928-34. 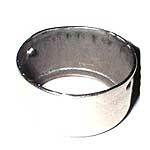 When using a 32' style centre hinge on your model A, you will need this special retainer for the radiator shell. Hood Retainer mount set 1928-31. Two tube style rivets to mount the centre hood rod bracket to the radiator shell. Set of 2. Made in USA. Crank hole cover 1928-29. Made from stainless steel, and comes with the mounting rivet & lock washer. Made in USA. Crank hole cover 1930-31. 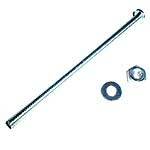 Made from stainless steel, and comes with the mounting rivet & lock washer. Made in USA. Crank hole cover mount set 1928-31. The mounting kit for mounting the crank hole cover. Kit includes the tube rivet, and the small lock washer as original. Made in USA. Three piece conduit set for the 1928-31 Model A Ford. These are the stainless conduits, that the wires go through from the radiator shell to the headlight and horn. Note: If you have the early 1928 that has the 5/8" hole out the back of the headlight, order the A-14578-AR set. Headlamp conduit set for the early 1928 Model A. This set is for the early 1928 that has the 1/2" socket on the back of the headlight. Conduit Ferrule 1929-31. This piece slips up on the headlight wire conduits to the headlight sockets. They come with conduit sets. Stainless. Made in USA. This is the early style emblem with the blue background, which presses in like the original. The button on the back of the emblem is supposed to press into the shell but these do not fit very well. We recommend gluing to the shell with adhesive.